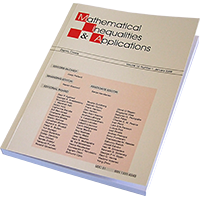 'Mathematical Inequalities and Application' ('MIA') is a subscription journal which offers a possibility to make your article freely available online upon publication by using an Open Access on Demand (OAD) program. How much is the open access publishing charge? For authors opting for Open Access on Demand, the fee is 250 EUR. Can the open access publication fee be discounted or waived? See the list of Free Waiver Countries. Under what form of license is the article published? Copyright on any research article in a journal published by an Element Open Access journal is retained by the author(s). Authors grant Element a license to publish the article and identify itself as the original publisher. Authors also grant any third party the right to use the article freely as long as its integrity is maintained and its original authors, citation details and publisher are identified. If, after publication, there is a reasonable consideration that the article should be removed from our website, for example, because of a breach in author warranties, we may withdraw it. In such case we will be under no obligation to refund the open access article publishing charge. What is your policy on article deposit in repositories? We support tagging and cross-referencing of articles within repositories so that they relate back to the original research grants and programs.